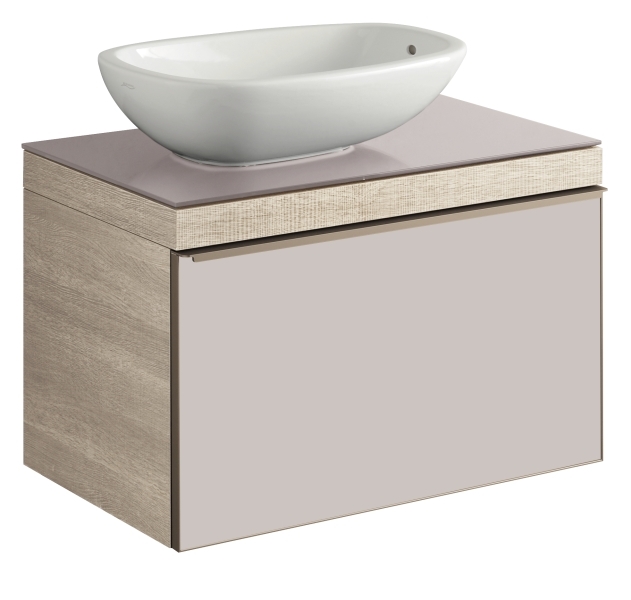 Oak finish vanity unit part of the CITTERIO range, featuring a glass plate with left or right siphon cutout and a pull-out drawer with a self-closing mechanism and a champagne coloured handle. Can be combined with CITTERIO countertop wash basins. 734 x 543 x 504 mm. Nature beige wooden structure, glass front and plate in taupe. Grey-brown wooden structure, glass front and plate in black. Two feet, 210 mm high, champagne in colour.